How quickly the landscape changes, even when one travels on foot. 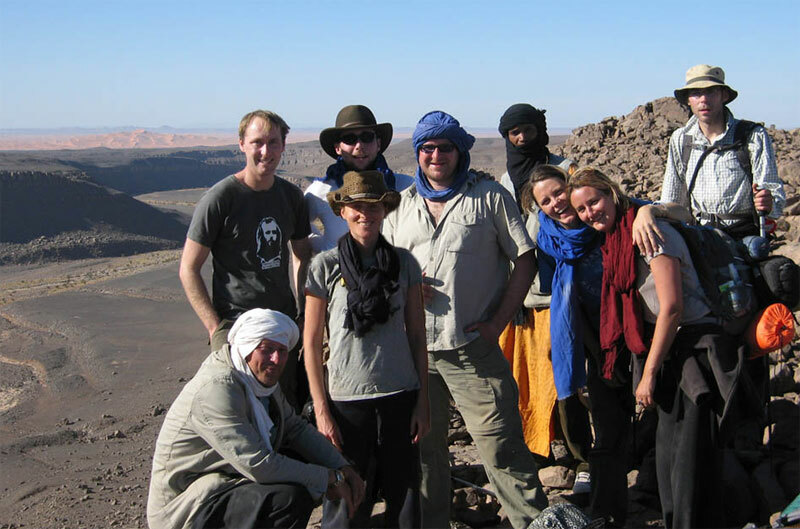 In November 2007 I joined a recce organised by London-based Simoon Travel and Tanezrouft Voyages. 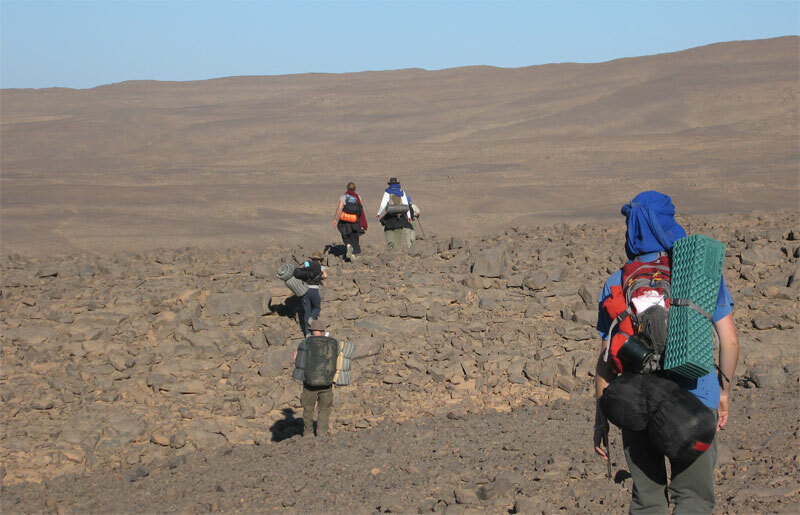 Over 11 days we walked about 200kms from south of Arak through the northeastern Immidir to the Amguid Crater and the Bou Zerafa dunes beyond. 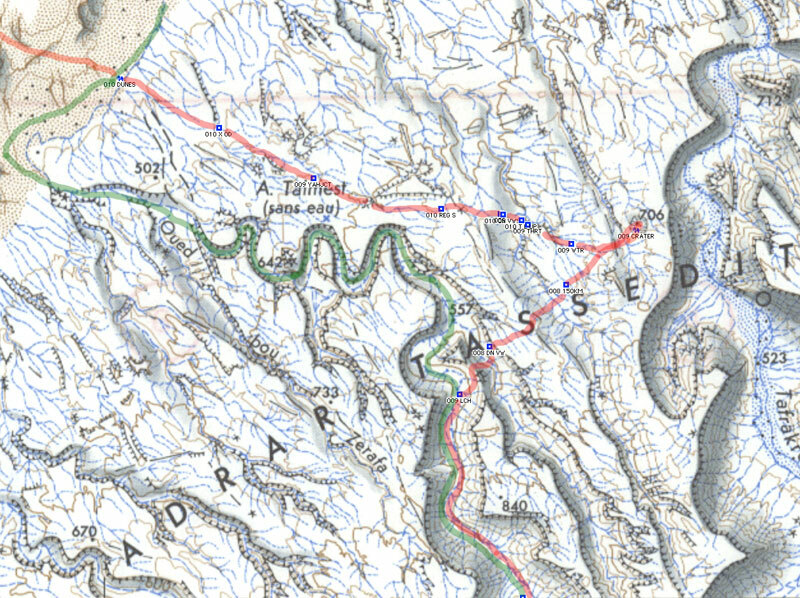 The Immidir, aka the ‘Monts du Mouydir’ on the Mich map, is a region of plateaux and outcrops that straddle the Trans-Sahara Highway around the gorge of Arak (see map, left). To the south are the lovely exfoliated grantite domes around Tidikmar and Moulay Hassan which we visited in 2005, and to the north and east of the TSH are a number of tilted sandstone plateaux with the typical south- or east facing escarpments and mixed up drainage of the Tassili N’Ajjer with which they might be considered geologically contiguous. 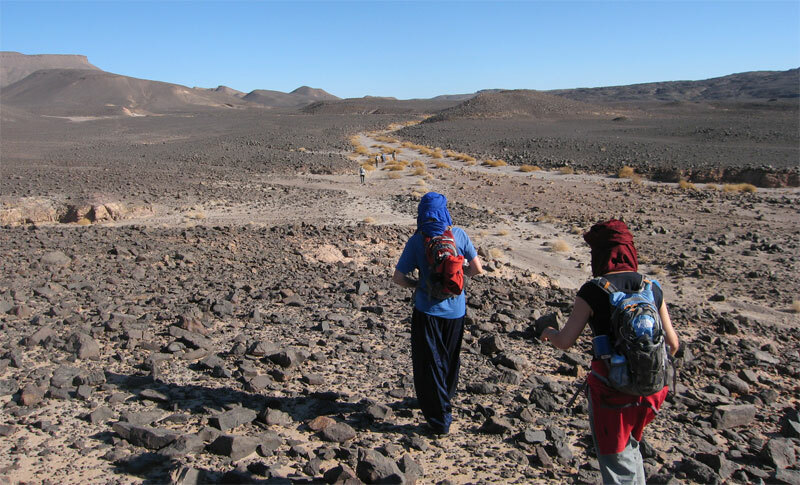 A few groups have followed part of our route through the Immidir before, and I know of a few others who’ve approached the crater from the Habedra piste by car and walked the last 10-20 kms, but no one has combined both. It was an idea I’d offered a couple of years ago with Tanezrouft and then proposed to Libya specialists Simoon. They liked it, found some people and so here we were. After arriving at In Salah, we drove south 300kms along the Trans Sahara Highway to this valley a few kms beyond Arak settlement. The camels and crew had been waiting a couple of days. Next morning we set off north up the Ighaghar valley in the middle left of the picture. The first few days with a south wind were hot and at times the terrain proved to be tougher for the camels than I expected. On Day 1 a few camels stumbled and lost their loads getting to the top of the Taflout Pass pictured above. By the next day we had a morning wandering through the cool box canyons and welcome gueltas for which the Immidir is best known. This place is just behind the Arak Gorge. 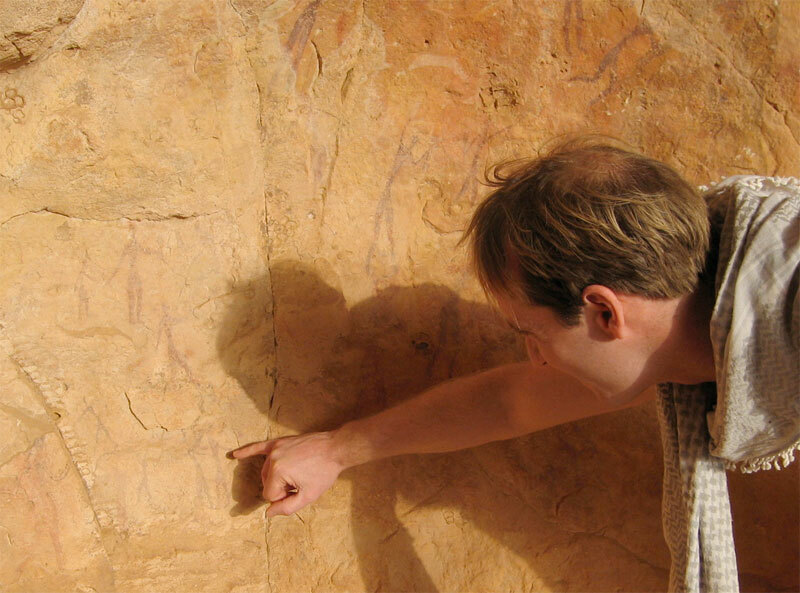 Although there was rock art to be found, what we saw wasn’t really up to the quality and density of the eastern N’Ajjer, Akakus or the Gilf. Most days we came across a desert mosque or some sort, although I’ve never seen the ‘pewed’ examples we found in the Immidir. 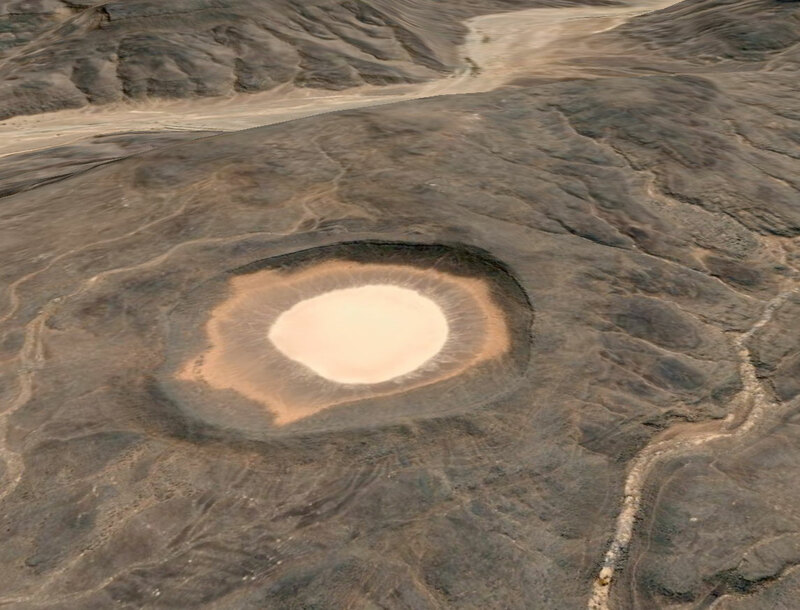 The inset shows a similar structure viewed from Google Earth at Aguelman Rahla guelta, 13kms directly north of the crater at the mouth of Oued Tafrakrek (see Google image below). 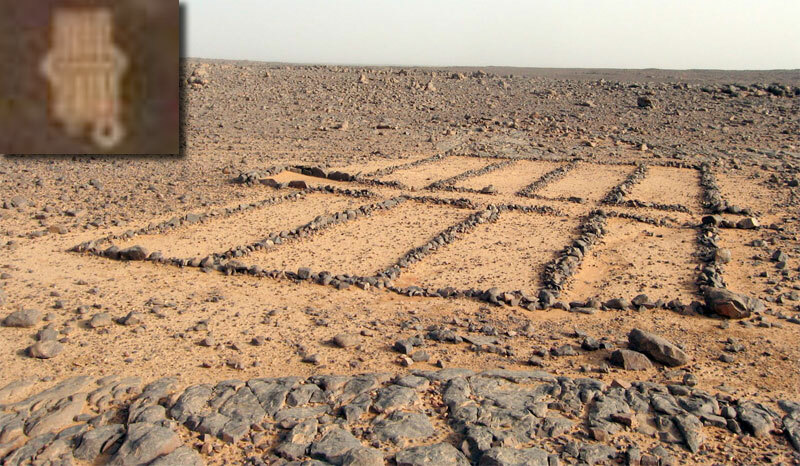 Google Earth shows the permanent guelta surrounded by pre-islamic tombs (including the less common keyhole type) which suggests like many Sahara oueds, the place has long been inhabited. What tracks there were were old camel pistes across the hammada. Rubble like this was tough on boots and feet; most of us got blisters. Even the camels needed treating for cuts and one night the guides made them some hide socks. Some days the caravan took alternative, easier routes. Daily distances varied between 14 and 24kms. By the end we didn’t even notice a 14-km morning. 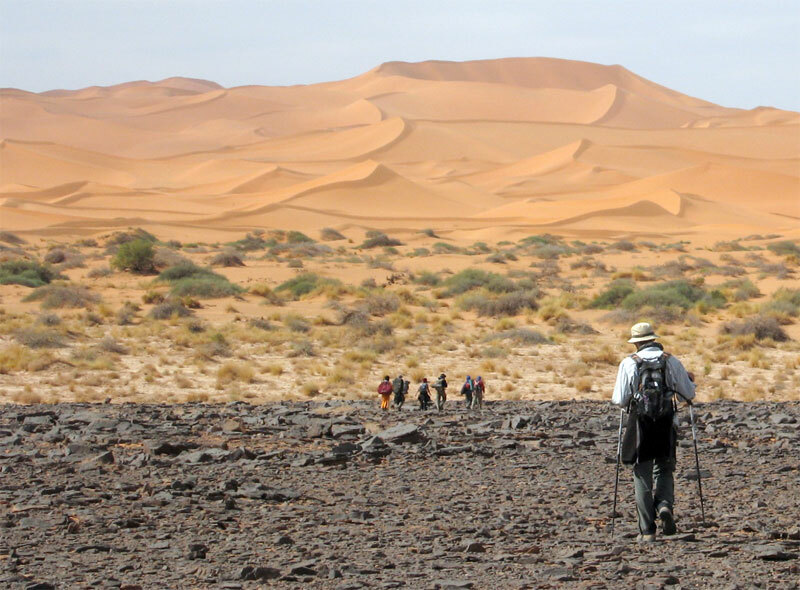 The route is inaccessible to vehicles but we passed plenty of mouflon, jackal, gazelle and fennec trails and once saw camel tracks other than our own. This was a nice day; about 24 clicks round the back of the guelta below, over a ridge where one camel collapsed and needed unpacking and a gentle kicking. Then round to the big oued above which fed the gorge pictured below and into a series of small valleys where I found an intact pot. Later it was fun marching on alone trying to catch up the caravan somewhere up ahead with the security of knowing the others were following. 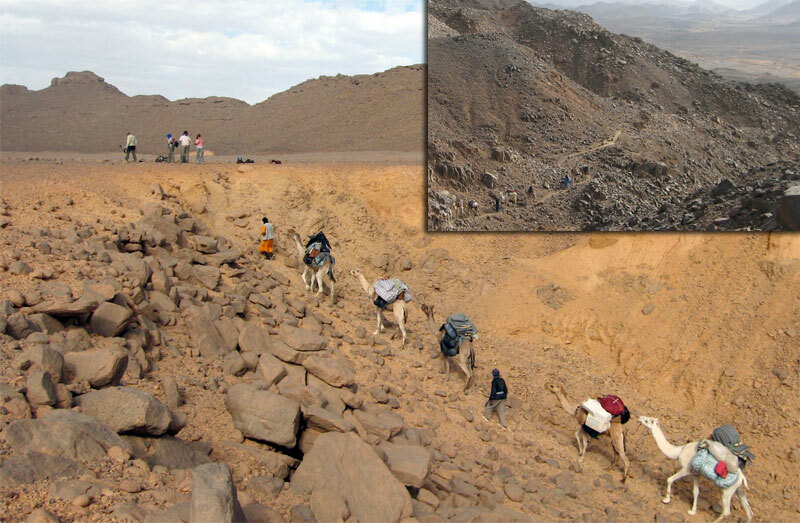 At times it took a little tracking to uncover the lead camels’ trail. Easy in sand, trickier on rock. 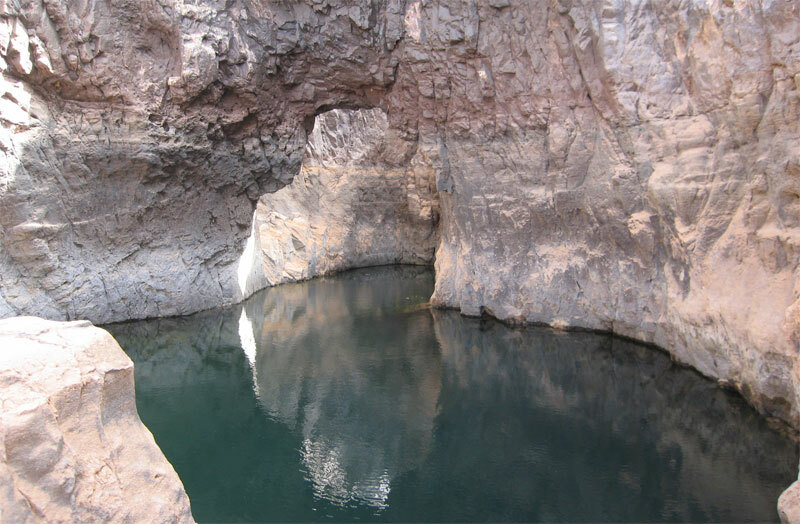 One lunch stop was by a deeply-carved gorge strung out with several waterholes (gueltas) and this arch. With no wells along the walking stage, the crew refilled from sources like this. People are put off by the colour but of course what makes you ill you can’t see, even in crystal clear water. Being early in the cool season following the summer rains, the water was probably fresh enough and if the crew could drink it so ought I. So as an experiment I drank the water as it came but didn’t get ill.
Interestingly ‘flying’ over our route on Google Earth reveals the region awash with gueltas. The gorge above (N24.317′ E 03° 58.506′) is almost one long pool and elsewhere we or the camels would not have got through some valleys and gorges without swimming. Mohamed H of Agence Tanezrouft and Sidi Ali our cook coming through. Sidi and the crew’s work started when we stopped walking for the day and carried on until we set off before them next morning so we didn’t resent them riding. We could too and those that did remarked what a relief it was to be able to look around at the scenery instead of dodging the next rock underfoot. 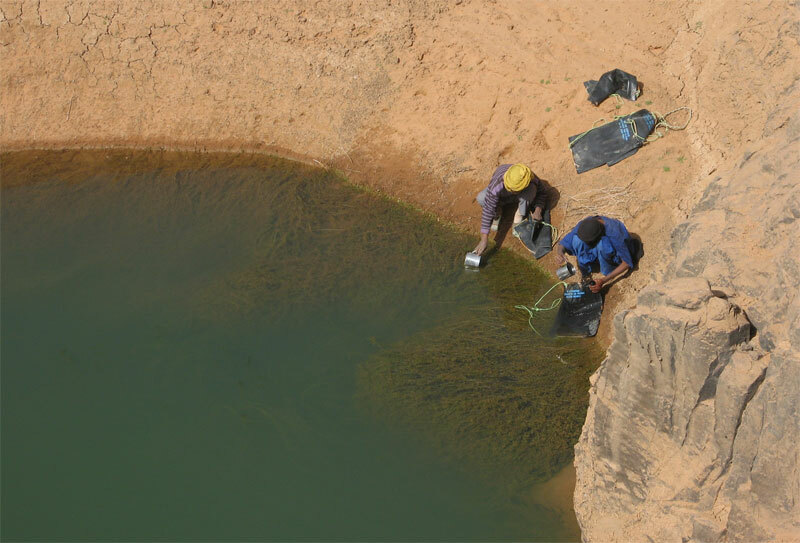 After a while it didn’t take much hesitation for us to grab a quick wash or launder at any guelta we came across, or even dive in for a swim. 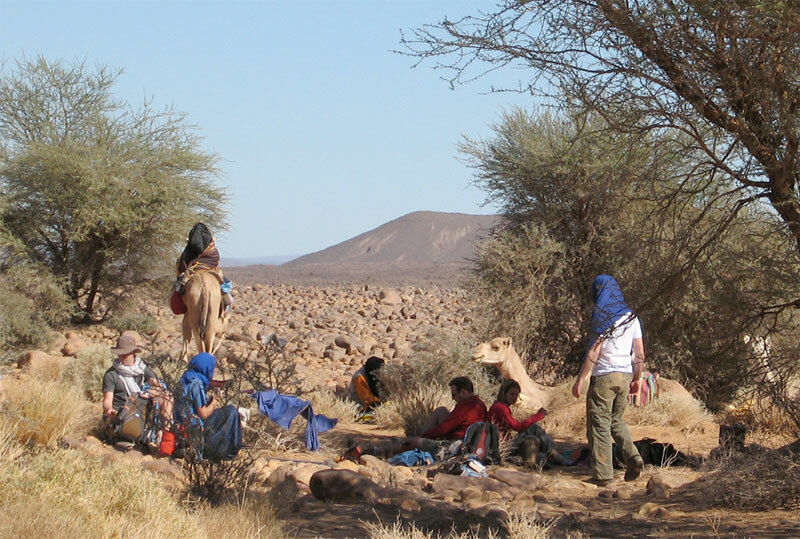 Like all tassilis, the Immidir has countless gueltas which make it suited to camel trekking. You can see from the ‘tide lines’ how deep this one fills after heavy rains. Some shade always cropped up around lunchtime or ‘midi’. 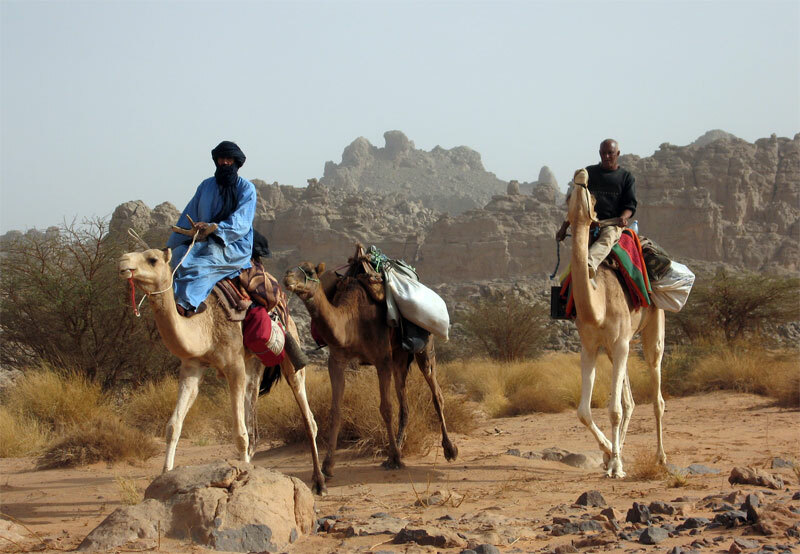 Usually we’d have to wait for Sidi Ali and his lunch camels to catch up. Then while we siesta’d the main caravan might pass through and keep going, usually getting to our evening camp ahead of us. Food. Breakfast was light: coffee with hot milk and baguettes, sand bread or pancakes with jam and marg. We were sometimes given dates and a soft drink for the road. Lunch was a heap of mixed salad or veggie rice followed by mint tea and an orange while they lasted. We has more tea/coffee and biscuits soon after we stopped walking for the day. Dinner was soup and bread, a main course of cous cous/rice/pasta and stew – all variations on dried goat meat followed by an orange and mint tea. Most of us brought some sort of snacks and I brought my v-kettle (right) with drinks/soups which came in handy while waiting for the lunch camel to turn up. Although I ate much less then I normally do, I eat too much anyway and saw the trek as a chance for a bit of a detox. I lost about half a stone but was never hungry. 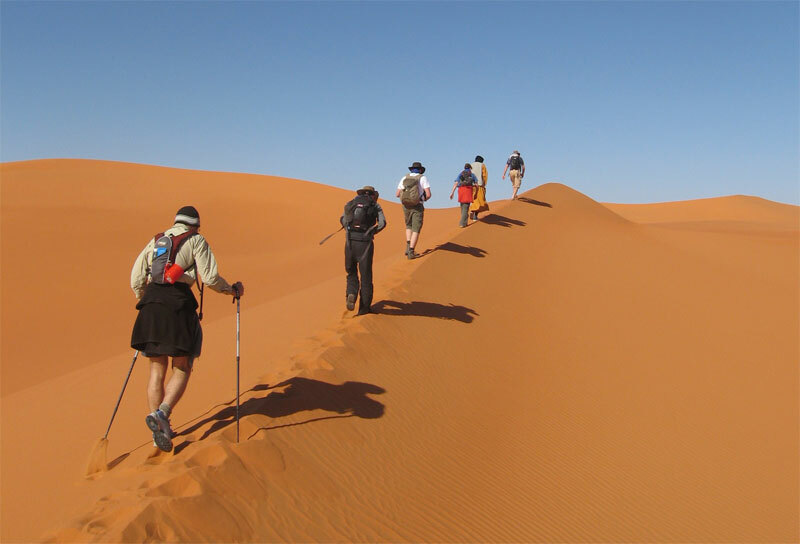 The daily ritual of walking, sleeping, chatting, eating and resting was very satisfying; as always the desert demonstrates how little you need to be content. 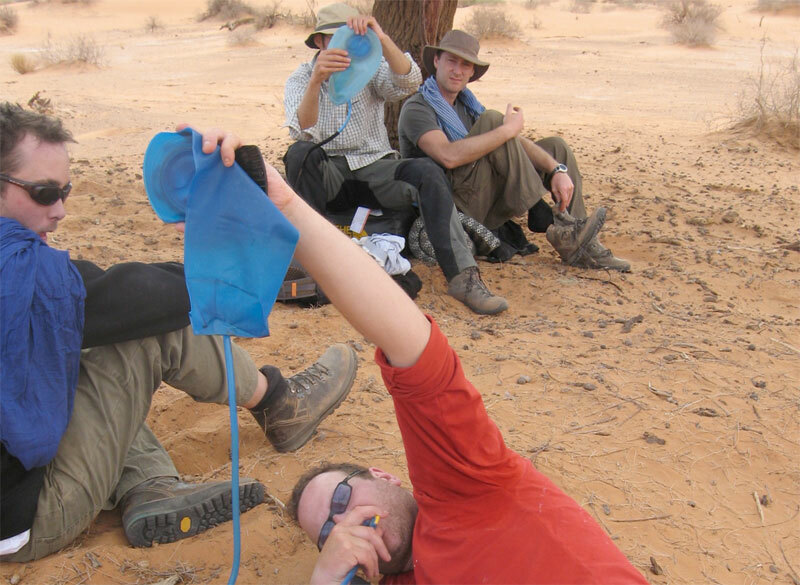 I carried about 2.5 litres of water in a Camelbak (bigger than most) and never ran out. On the earlier hotter days at about 30°C I got through 2L a day, later in the low 20s it was about a litre. About the same as summer in England. Come the big day the chattering subsided but we were still smiling when we got to the top of this gnaaarly climb, having unnecessarily gone up and down another ridge (see map below). With us we carried overnight gear, a bit of food and -no surprise to me having done these sort of walks before – not enough water. At the top of the climb we got our first sight of the Bou Zerafa dunefield 20 kms to the north and from this picture overlooking the camel route below the crater was only about 6km to the east. Before we set off from Arak I didn’t have a clue which way our guide Yahia was going to reach Bou Zerafa other than north some way. A map didn’t mean much to him so there was little point asking or pointing and Tamachek names don’t always match the map’s Arabic. 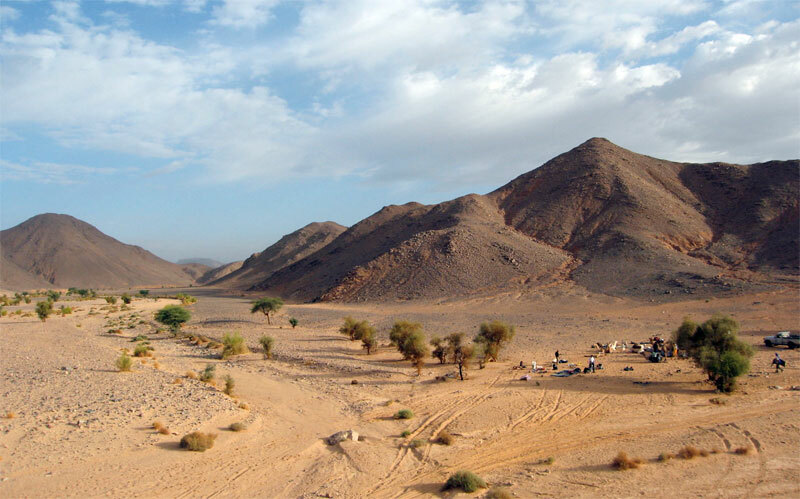 I presume then it was a total fluke when his route led far to the east below the Adrar Tassedit escarpment before turning north up the Oued Bou Zerafa – or Oued Tassedit as they called it. It could not have passed closer to the crater site. So east we went. The broken terrain reminded me of a mild version of Ginge Fullen’s attempt to climb Bittu Bitti, Libya’s highest peak (see p.377 in the book). Between us and the horizon where the crater surely lay were any number of chasms, clefts and gorges. Near this point we passed the 150-km mark which put the crater at nearly 100 miles from our departure point near Arak. Just on sunset and having covered 7 tough kms in 3.5 hours, we sat ourselves down in the middle of the crater pan. Not sure what we’re all laughing about; we each have less than a litre of water left so tomorrow was going to be a bit of a march but our goal had been accomplished. From the left: me, Yahia the guide, Francoise, Jon the photographer, Imogen, Amelia of Simoon, Bob, Amelia’s husband Lex who tracked the whole route on GPS and Tom. 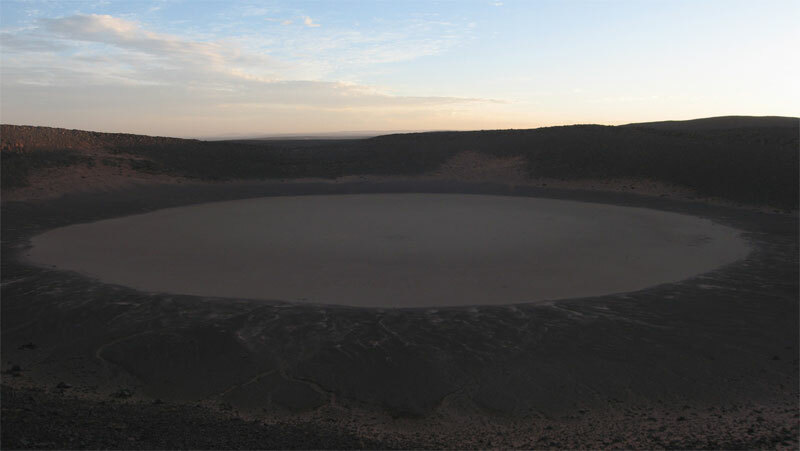 The crater is thought to have been formed less than 100,000 years ago and the first recorded visit was by a French geologist in 1969. 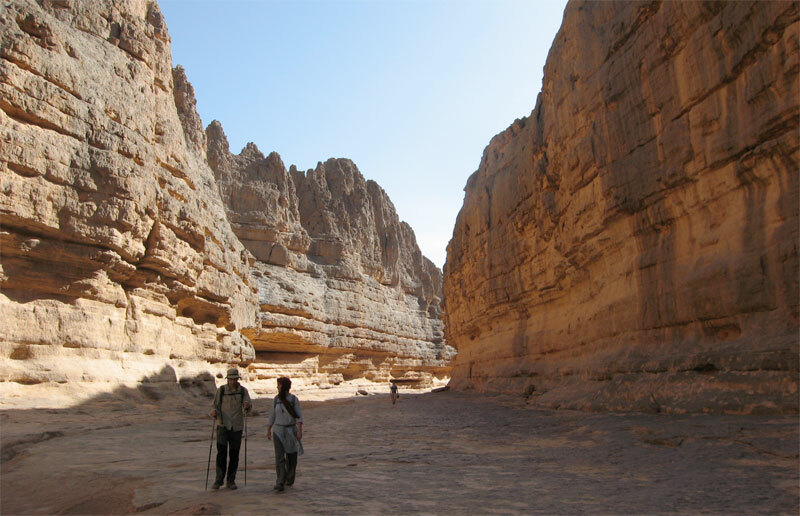 For us it would have been nice to explore it in sunlight and I’d also hoped to take a hike over to the Oued Tafrakrek rim a couple of clicks to the east. 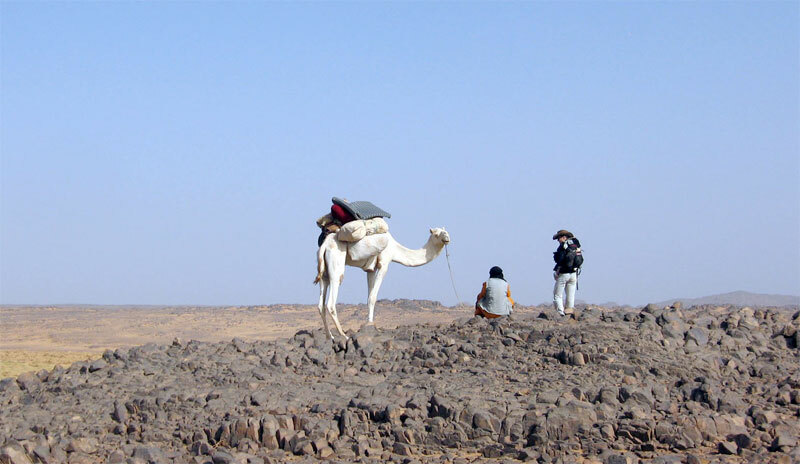 But having chatted with Mohamed on the sat phone, Yahia explained to us the camels were already heading for the dunes so to intercept them we had a longer cross-country walk the next day. I went to sleep thirsty, woke up thirsty and at first light decided to drink my last cupful while others chose to save a few drops for the hike. To make the most of the cool morning we climbed out of the unlit crater at first light and set off northwest to the dunes. 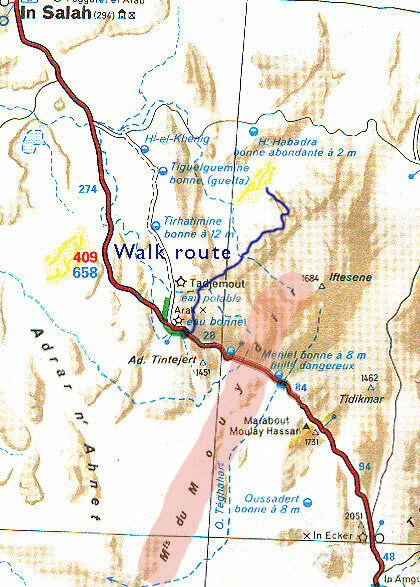 Here’s part of our route in red over the Adrar Tassedit plateau 8 days after leaving Arak. After lunch (009 LCH if you have bionic eyes) and repacking our gear we left the caravan trail in green, crossed a needless ridge (below the ‘A’ and then climbed back onto the plateau (‘009 DN VW’; the group shot 4 pics above) and then went up and down past ‘009 150KM’ to the crater at ‘706’. The map above is about 15 miles/25kms wide. 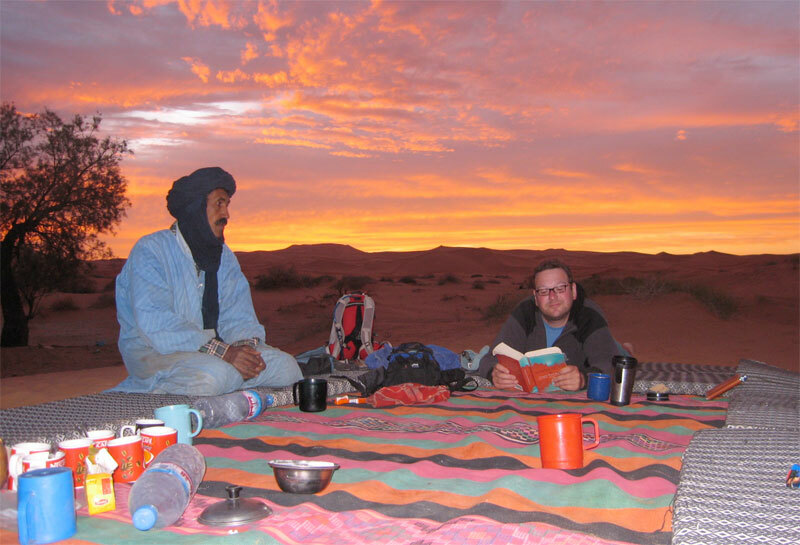 Although we were unsure to put our trust in Yahia as he’d never been here either, next day he led us to the dunes where our camels were waiting. Knowing water was scarce he lured us on, keeping just out of reach so there was no discussion about which way to go. 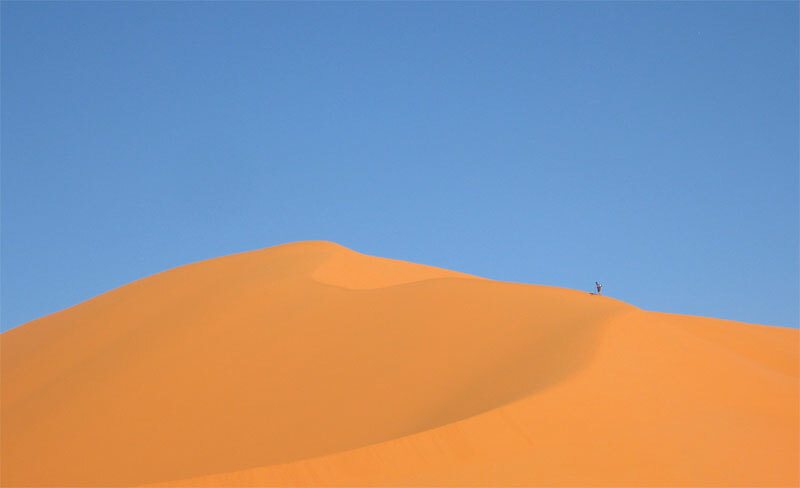 As the return route and waypoints show, his Tuareg ‘GPS’ was spot on. Apart from the easily-remedied water issues our route to the crater was as good as could be expected. 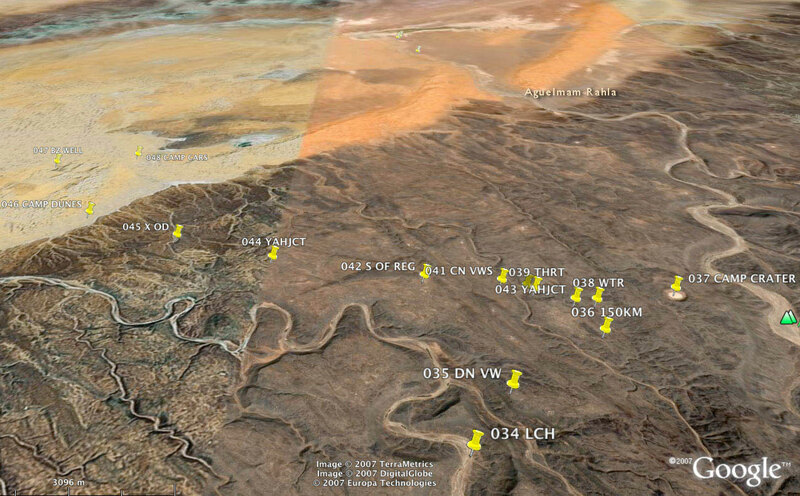 In 2009 we started at dawn at ‘557’ a bit to the north of our lunch spot, above the meander of the ‘T’ on the map. We climbed up the valley side with a bit of scrambling and had a much easier 2.5hr/6km each way walk to the crater. Next day we followed the green route along the canyon to the dunes and beyond, probably 30km but no one noticed by now. With some (myself included) a bit more parched than others (notably the women), we finally staggered off the plateau and onto the sands some 6 hours and 16 kms from the crater – much further than we imagined and having drunk no- or just a couple of sips of water. Everyone had quietly focused on the task. Luckily it was another cool day and of course we knew the crew was out there somewhere with water. Once on the sands some desperados cracked and drained the last gritty dregs from their hydrators while Yahia dashed off to track down the caravan out in the sands. A few minutes later Mohamed came galloping in with some water. We spent the rest of the day idling about and drinking everything they brought us. That evening, while contemplating the transit of Orion and Copernicus’ theory that meteorites never strike in the same place twice, a shooting star tore in low over the Tassedit plateau above the crater. With a bright green trail breaking up behind it, somewhere out there a new sprinkling of space debris had scattered itself across the desert floor. As we discussed the startling phenomenon a sonic ‘b-boom’ rippled over the sands, suggesting a meteorite had indeed breached the atmosphere. Someone knew the speed of sound and estimating the time after the sighting, Tom worked out it had fallen about 50 miles away, well beyond the crater. With this suitably astral climax to our crater day, Copernicus was proved right – again. … some took the low. We passed Bou Zerafa well marked on the maps. It was sanded over but Yahia assured us there was water a metre below. Winding up our 10-day rocky plateau trek in the glowing orange sands of an erg was perfect – another highlight after the crater. Next morning the cars turned up from In Salah with fresh food and water. 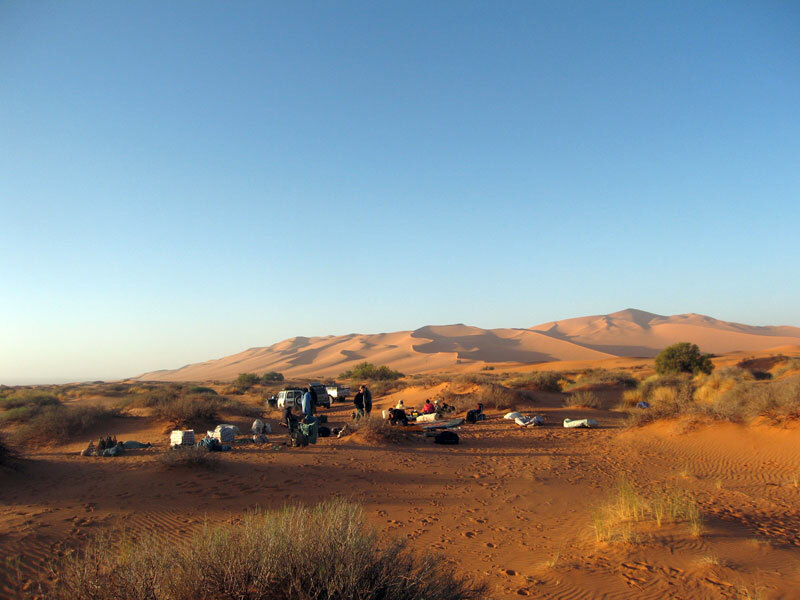 At this point my camera passed out but we carried on northeast alongside a dune ridge to one more camp (passing some lovely pestle-like moules to go with the countless grinders lying around). Another short morning followed to knock off ‘200kms’ according to Lex’s GPS tracking, right by an unmarked well with good water. We drove from there northwest to Tin Habedra well (sanded in) and then directly west along the Habedra piste passing escarpments lined with tall cairns and small, palmy sources while chased by a storm front. It showered a bit that evening and most took to the tents for the first time as lightning flashes circled us along the horizon. Then at 2am a bolt exploded nearby and a heavy shower drenched the camp. The tents held off the worst of it but next morning by the time we’d got the fire lit most weren’t in the mood for the planned splash about at Tiguelmine guelta on the old Hoggar route. We headed directly back for In Salah, a great feast at Mohamed’s, a plane to Algiers and home. This entry was posted in Uncategorized and tagged amguid crater, arak, Bou zerafa, immidir, sahara camel trek on October 3, 2015 by Chris S.